Roger Clark seems at home on the rim of the Grand Canyon. With only open air below, Roger stands atop limestone explaining to us the layers of rock that comprise this awe-inspiring view. Before the geology lesson, we sat beside hunks of metal bolts that had been installed to transport engineers from the US Bureau of Reclamation, who were studying the canyon below as a potential site for Marble Canyon Dam. The work of David Brower and the Sierra Club stopped this project in its tracks and set a precedent of permanent protection for this canyon. Roger began his career as a college professor and museum curator but after years he decided that was not what he truly wanted to do. Leaving academia, he naturally became a river guide on the Colorado River, forming a bond with the water and walls of the canyon. 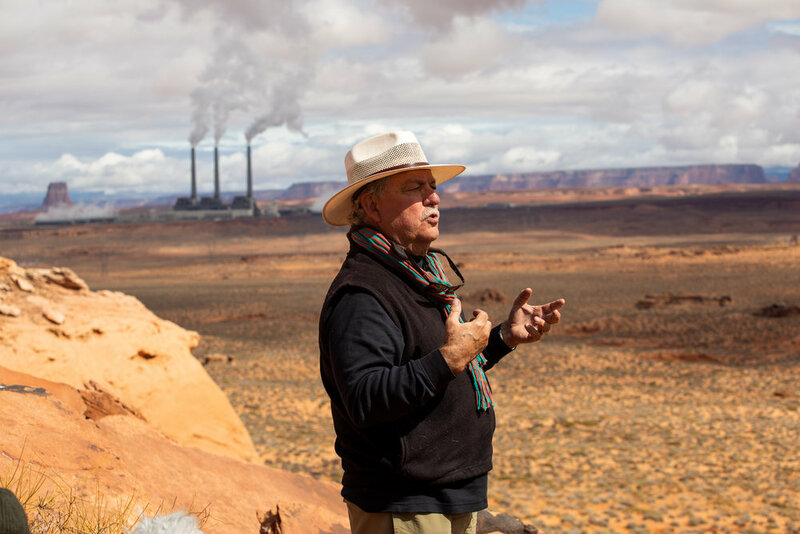 This love of the natural world is clear when he speaks about the multitude of topics that he is extremely knowledgeable and passionate about, ranging from uranium and coal mining to Native American tribal rights to development along the rim and preservation of the Canyon’s unique vistas. These are areas of immense challenge for environmentalists, and it would be difficult for a single person to take on any one of them. Yet Roger handles the entire Grand Canyon program with a subtle confidence and deep knowledge of history and politics. As an educator, Roger has a deeply welcoming and helpful spirit that encourages every question and always leaves the asker satisfied. After spending his life in this chasm of political and economic interests, natural and indigenous resources, and absurd beauty, Roger Clark showed us his Grand Canyon, and took us over the edge.